Dallas City Hall is located at 1500 Marilla Street, Dallas, TX 75201; phone: 214-670-3296. Photo: Mary Apartments, ca. 1925, 4524 Live Oak, Dallas, TX. Listed on the National Register of Historic Places in 1995. Photographed by user:Renelibrary, 2012, (own work) [cc-by-2.5 (http://creativecommons.org/licenses/by/2.5)], via Wikimedia Commons, accessed October, 2012. While the first settlement at "the Forks of the Trinity River" was made about the 1840s, Dallas was, for it first 3 decades, on or close to the "frontier" and had only the ordinary activities of the inland Texas town. In 1870, when the total population of the county was a little more than 13,000, the precinct which contained the Town of Dallas had 2,960 inhabitants. 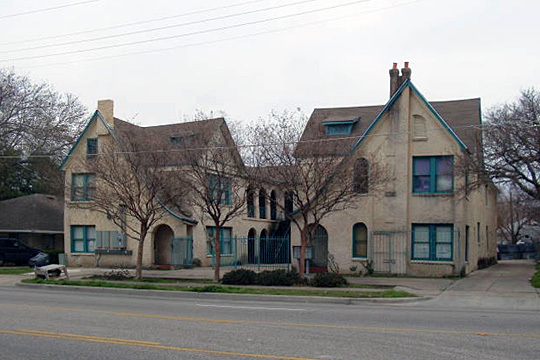 It was during the decade of the 1870s that Dallas became a city in point of population and commercial enterprise. In 1880 its population was 10,356. By 1920 the population had grown to more than 125,000. For 2 years after the establishment of the county seat (in 1846) there were only 2 stores in the village, and in 1849 the inhabitants numbered 50 people. At that time all merchandise, groceries and supplies of all kinds were hauled from Houston and Jefferson with ox teams. Trading became a regular business, and the charges were from 3 to 5 dollars per hundred weight. When the roads were good it required about 4 weeks to make the trip from Houston. A genial Dallas historian, Philip Lindsley, has said: "Life in Dallas in the early 1850s moved on primitive lines. An old fashioned hand mill, brought by one of the settlers in 1852 to grind the corn with, was in such demand that it was allotted to the applicants one day at a time. The principal meat was chicken, prairie hen and wild turkey. Wild hogs were killed in winter. Deer were plentiful, so were quail. A hundred quail could be caught in nets at almost any time. The old beef tallow candle was much in evidence, with scissors for snuffers. The was an abundance of wild honey and the wax obtained from it was melted and skeins passed through it until it would absorb no more. The skeins were then wrapped around bottles with one end sticking up over its top, which when lighted gave a good light and was called wax tapers. One sewing served the village for years. The pioneers of this decade were of the better class of farmers, chiefly from Kentucky, Illinois, Indiana, Missouri, Ohio, Tennessee, Alabama, Georgia and Mississippi with a few from nearly every state in the Union and Europe. Peace, law, order and neighborly kindness characterized them. A more kind or law-abiding people did not exist." The main line of the Texas and Pacific Railroad was completed to Dallas in 1873, and as a result of the financial panic of that year, its westward progress was halted until 1876. It was the railroads that gave the first great impetus to Dallas' growth. Improvement came rapidly, and the population of the City doubled during the year 1872. In that year a new iron bridge was constructed over the Trinity River; a street railroad was in operation from the public square to the Union Depot, each of its 2 cars drawn by 2 small Mexican mules; the beginning of the construction on the Dallas and Wichita Railroad was made in November of that year and in 1876 the line penetrated Denton County. At that time the importance of Dallas as a wholesale center became firmly established, and the business district about the public square was filled with freighting wagons loaded with supplies for all parts of North and West Texas. A new courthouse was completed in 1873. In 1877 Dallas had six flour mills, two cotton compresses, two grain elevators and two foundries. There were six banks. By 1890 Dallas had a letter carrier system, a salaried fire department, and a uniformed police. A state publication in 1882, containing a report on Texas counties, said of Dallas: "The City of Dallas is eligibly located on the east bank of the Trinity River, and has many large and imposing churches, and other public buildings and handsome private residences. It is the great railway center of North Texas, and has an estimated population of 18,000.